Thermal software for heat sinks, circuit boards, enclosures, systems, boxes, transformers, IC's, power transistors and other electronic components. Welcome to the official website of the Sauna thermal modeling software package. The Sauna software package is for the thermal simulation of a wide variety of electronic components and systems, from simple heat sinks (heatsinks) to complete boxes with internal circuit boards (PCB's). 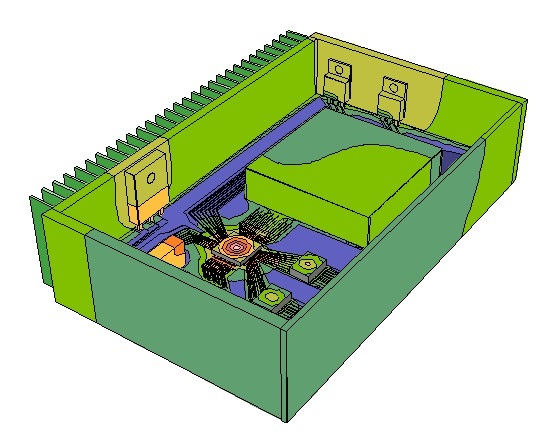 You can use Sauna to create highly detailed models, such as the box shown above, where there is a detailed trace-by-trace representation of the PCB. But Sauna is also a great tool for completing a quick and dirty model. Simple or complex, the choice is yours. The Sauna program is quite easy to use. The program includes a large library of standard components and pad layouts, including standard power packages (TO-247, TO-220, DPAK, D2PAK, SOT-223, TOLL), dual and quad flat packs (SOIC, MQFP, LQFP, QFN), low and high power LED packages, as well as user-defined packages. The program incorporates a full 3D modeler, with specialized tools for quickly creating boxes, plates with fins, pad patterns and other geometries common to electronics thermal analysis. Heat transfer coefficients for both convection and radiation are calculated automatically. You can calculate temperatures in steady state, transient or duty cycle modes. All these powerful features are provided at a very moderate prices, starting at $995. Depending on product version, expert technical support is provided for either 6 months or 12 months. Sauna is an outstanding value. To learn more about Sauna, please use the index bar on the left to view the many informative pages contained on this site. It is suggested that you start with Sauna Overview. (If you're in a hurry, just look at the pictures.) A free evaluation package is also available. Feel free to ask questions, contact information is available here. 10 Sep 2018: Sauna V4.55 is now available. Sauna V4.55 includes a series of enhancements which primarily target circuit board modeling. Key changes include improved trace and pad drawing in shade mode, library additions (14 packages), easier modification of copper weight, and more. For more details, please see Sauna V4.55 Release Notes.